The bookstore is chaotic with five kids. It’s also one of their favorite places to go and spend an afternoon or an evening, and they will happily fan out and disappear into their preferred stacks. This particular store is a family favorite, with tall, seemingly endless rows, and prices that make a $2 book allowance stretch far. As always, Bean is the wildcard, and sometimes he cannot resist racing the little metal basket-carts up and down the rows. If the store is nearly empty, I turn a blind eye. Last night, he was on the prowl for a particular book, which always makes the trip better. Unless, of course, you are eleven, and the author you are looking for is named “Smith” and that’s all you know. But that’s not what this is about. This is about the science and biology section. No matter where the four other kids scatter to— and I can usually tell by the giggles and goofing off— this is where Abigail will be. Last night, her sister came to me with an entirely appropriate angsty teen novel, while Abby held out a hardback, college textbook simply labeled “BIOLOGY”. I smiled. I love them both so much. Abby and I flipped the gigantic book open, while Kelsey skipped off to find her brothers. The first page was about meiosis, and there were microscopic photographs of chromosomes. She was interested, but it was really heavy reading for an 8 year-old. Gently, I suggested she head back to her favorite aisle and see what else she could find. The Biology book stayed in my basket, on reserve, and she, too, skipped off. As I wandered around looking for Bean, I glanced to my left. There stood this beautiful little girl, deep in concentration over another science text, oblivious to the noise and surroundings, lost in her own world. I marvel at her- her focus, her sense of who she is already, her calm certainty and this indescribable dignity she has always possessed, which I can recognize, but which I utterly lack— or certainly did at 8 years old. It was just a moment in time. I snapped the picture and resumed my interminable and constant search for Bean. I smiled. How did I know? We proceeded to have a quiet conversation about Charles Darwin, and his importance to science. We talked about natural selection, and how Darwin was the first scientist to put forth his observations and theories about evolution. We talked about the Galapagos Islands, and what happens when species have little or no interaction with outside influences, and how that helped form his theories. She nodded seriously, and picked up the Biology book, “I think I need to get the Charles Darwin book. 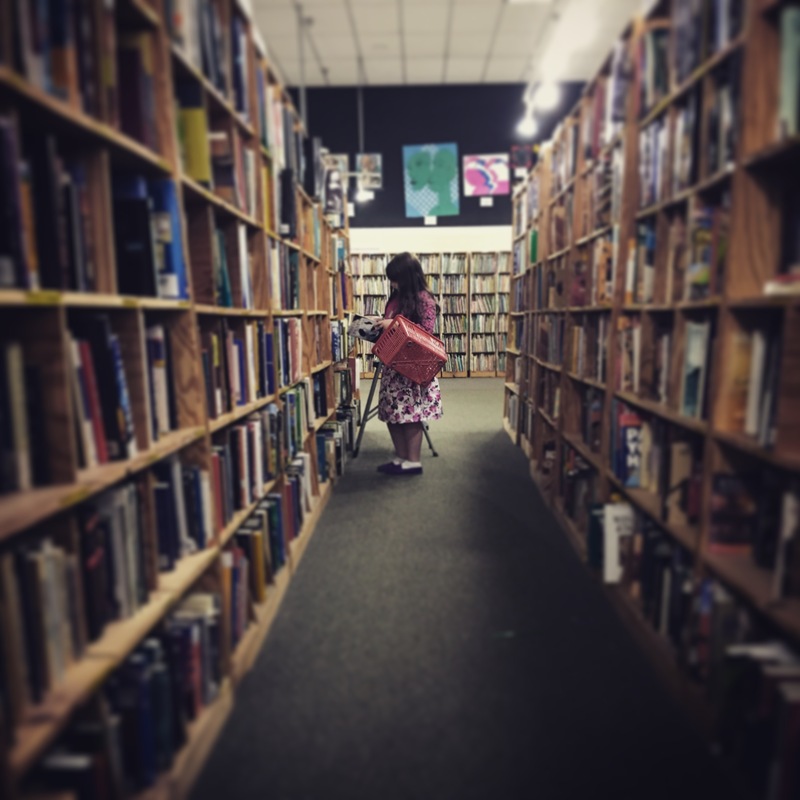 I’ll put this one back.” And she headed off down the long, book-filled aisle. I thanked him, told him it was all her, and I deserved none of the credit. He shook his head and smiled, and he wished us a good night. Abby ran back up, thrilled that she’d found a very pretty, hardback copy of Darwin, with a pale blue cover and red and navy binding with gold lettering. It was over her budget, and she was concerned… My dear child, I thought, it is my privilege to buy this for you, and with great joy. She took it to school this morning for show and tell. I love this…and love so much Abby’s peace and assurance in her identity. You are an amazing mom!